Archaeoscope offer a variety of surveys, using either Total Station Theodolites, GPS or hand measurments depending on requirements. Recent work has included GPS based landscape survey to create detailed elevation models and contour plots, TST topographic surveys to facilitate architectural design and redevelopment, and hand measured surveys of existing buildings to create floor plans and elevations for planning application submissions or historic building appraisals. We have also undertaken survey projects associated with rectified photography building recording. The images above are samples from two elevation and plan surveys carried out prior to architectural planning applications, and the elevation of the Assembly Rooms, York, created through a combination of TST survey and rectified photography. 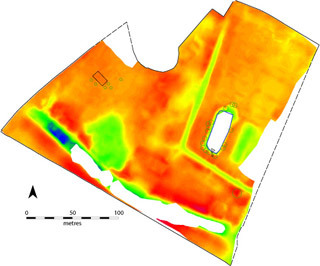 The example below (left) shows a digital elevation model of Cawood Castle Garth, a Scheduled Ancient Monument and former residence of Cardinal Wolsey, advisor to King Henry VIII. The DEM shows lowest areas in blue, through green, yellow and orange to the highest areas in red, and clearly indicates the position of ditches (blue and green), a possible quarry pit (green, middle left) and an infilled fish pond (green, right). Areas in white were inaccessible due to vegetation or water levels. This image is derived from data collected using Leica TST & GPS equipment recording readings at close intervals. The DEM was created using the G-Sys software package, a bespoke GIS system developed by the Landscape Research Centre. This is perhaps easier to interpret when rendered and animated, as shown to the right. DEM: Cawood Castle Garth, blue is lowest, red highest. Rendered & Animated model.